One of the features we do here at Comic Impact is the cosplay girl (NO anime, manga, role-playing games just comics) of the month, that’s right hot girls dressing up like your favorite super- hero characters. This month we’re privileged to have Roxanna. 3-Do you read comics and if so, what are your favorite titles? I do! In true girlie fashion, I’m a sucker for Amanda Conner’s art, so I’m loving Powergirl right now. I’m also enjoying the new Batgirl. But my heart will always belong to Green Arrow and Black Canary, no matter how odd and convoluted their story is becoming (I do miss the Judd Winick days). I love Marvel equally, but I don’t seem to be following any particular Marvel title at the moment. 4-What is your favorite comic book character? Green Arrow for DC (swoon), Nightcrawler for Marvel (swoon). 5-Who are your favorite artists or writers? I guess I already started on this question, didn’t I? I love Amanda Conner, Adam Hughes of course… others are slipping my mind… Writer-wise, I’m not very good at keeping track, but I really enjoyed Kevin Smith’s run on GA/BC as well as Judd Winick’s. In the non-superhero vein, David Petersen has my undying devotion for Mouse Guard. Some other favorites are Christian Slade, Jeff Smith, Guy Delisle, and Ursula Vernon. My taste generally runs towards the goofy, adorable, and otherwise undignified. 6-What got you into cosplay? Peer pressure! Haha, no, seriously. 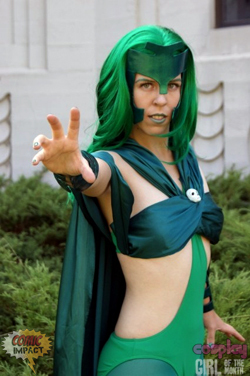 I’ve always been a cosplayer/costumer, even before I knew what that was. As a kid I made costumes all the time, and was always that girl with the weird Halloween getup made out of cardboard and scotch tape. Thus, you could say my first cosplay was my original character “Super Rat” at age 7. 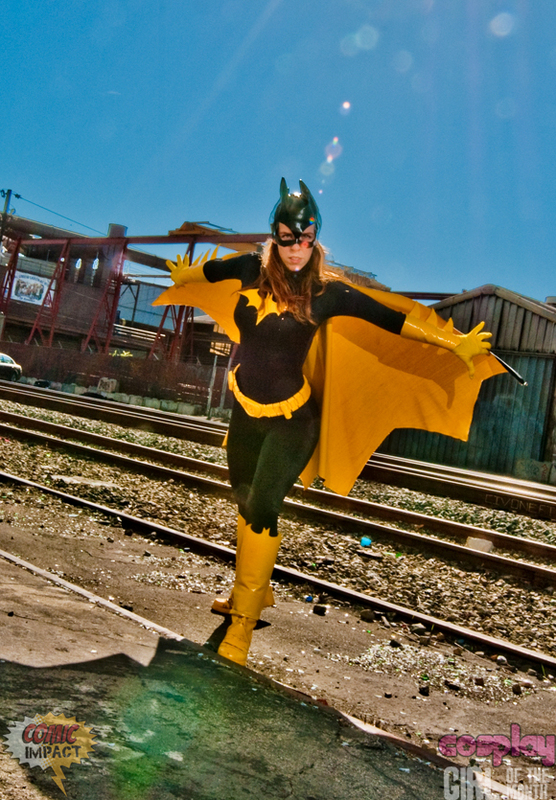 By the way, United Underworld includes LTC America, Cosplay Girl of the Month for May ’09. Glad ta know ya, LTC! 8-How long does it take for you to make a costume? Several months of research, purchasing and receiving supplies, construction, failure, going to the Superhero Costuming Forum for advice, purchasing and receiving more supplies, sewing, cursing, sewing, constructing when sewing fails, and then realizing it’s not going to work that way and starting over. I usually end up spending several hundred dollars on a costume, much of which goes to materials and pieces that aren’t in the final product. But I have so much fun in the process! 9-Have you met any of the artists or writers where your costume is based on their work? I was super excited to meet Amanda Conner at Dragon*Con last year, and although I wasn’t wearing my Canary, I told her about it and she was pretty psyched. Hopefully I’ll be able to show her at WonderCon this April. Did I mention I’m a hopeless fangirl? 10-Do you buy any toys, busts and etc. based on some of your favorite costumes? I have plenty of toys! I love dolls, so I have the Barbie Black Canary and Batgirl, as well as a bunch of action figures. I also have some toys of characters I don’t dress up as, such as my gorgeous Tonner Harley Quinn. No busts though – I’ve gotta be able to pose ’em! 11-So do people know you dress up like a comic book hero on your free time? Yep! My parents are unsurprised, given my history… my coworkers think it’s cute/hot/completely hysterical… and my friends usually are dressed up with me at conventions! One of my costumes, Domino, actually belongs to my best friend Psykitten. We call it the “Traveling Pants” costume, because three of us have worn it and embellished it by now. 12-What is the funniest thing that has happened to you at a convention? Conventions are basically made up of a series of surreal, hysterical, utterly entertaining events interspersed with standing around doing nothing. Here’s one of my favorite little stories. …Yep. It was a guy cosplaying Waldo. 13-Do kids come up to you and think you are the real life character? Kids are interesting in this respect… From my own childhood memories and from what I’ve observed, when faced with a person dressed as their favorite character, I think a child doesn’t really care to make a distinction between what’s real and what isn’t. Deep down, they may suspect I’m not ACTUALLY Batgirl, but pretending I really am Batgirl is so much fun that it overshadows everything else. I love children’s imaginations. 14-What do you like to do when you’re not costuming, such as other hobbies? I love to read and write children’s literature; I do collect certain toys, such as My Little Ponies (old school), and I enjoy taking photographs as well, often of those toys! In a more mature vein, I’m a huge animal lover and spend a lot of time working with dogs in particular. I just got my first apartment and am really excited to be fixing it up and turning it into home; and I’ve become quite a foodie and locavore these days too. Combined with costuming, all those things could take up twice as much time as I actually have! Whew, that is MORE than enough! Thanks to Rendy Lai, Eurobeat King, and Patorama for pictures, and thanks everyone for reading!